Unfortunately for them, chameleons somehow have a reputation that they are rather difficult to keep. While this might be true in some respects, that doesn’t make them bad pets for everyone. 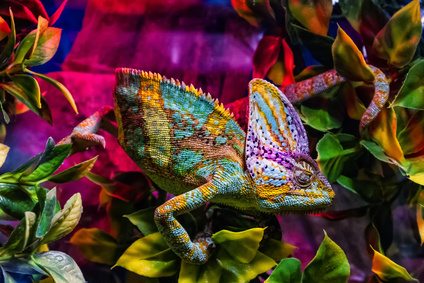 Of course, before deciding to become the owner of a chameleon, you do have to consider the fact that they aren’t companion animals, such as dogs or cats. You won’t be able to pet them or interact with them other than analyzing their moves in the enclosure you’ve put together for them. Reptile lovers might find caring for a chameleon a piece of cake. And that’s because they are probably already aware of the fact that reptiles are cold-blooded, which means that they need a basking spot in their enclosure where they can heat up for a bit. One of the so-called drawbacks of becoming a chameleon owner is related to the fact that the initial costs are quite high. The animal itself will cost you anything from 50 to 350 dollars, depending on the exact type of chameleon you’re looking to get. The best cage for a chameleon can be priced between one hundred and one thousand dollars, depending on how much you are willing to spend. Finally, the extras such as the plants, be they artificial or natural, as well as the lighting, might ultimately bring your bill to over fifteen hundred dollars. Something other that we would like to add is that many wild reptiles are infested with parasites. So, that is why it is a good idea to get your chameleon from a breeder. Determining the health of the pet before purchasing it also has to be done, and if you have no means of telling whether its skin, colors, and activity levels are on par, we suggest contacting a vet or a vet assistant for this purpose. He or she will be able to assess the health of the reptile and thus ensure that you’re making the right decision. There is an ongoing debate as to whether chameleons make good pets or not. For children, they might not be the best option, as most kids have high energy levels and would much rather play with a pet instead of looking at it for hours. Sure, chameleons are fascinating, without a doubt, but they aren’t cuddly, and they shouldn’t be held. For kids with allergies, we recommend special breeds of cats who are hypoallergenic, such as Cornish Rex, Bengal, or Siberian. Because getting a chameleon is a commitment, we suggest you understand the responsibility you are assuming before going through the whole process. If you’re becoming the owner of a baby chameleon, it will live for at least two to five years, and you will have to care for it for all that time. Consider that in some respects, dogs and cats are lower-maintenance as you don’t have to clean their enclosures regularly, and their waste is somewhat easy to dispose of. Plus, they’re cuddly and make great pets for children.